The dates have been set for our annual Spring Tack and Rummage Sale. For a black and white copy of the flier to print and post Click Here. 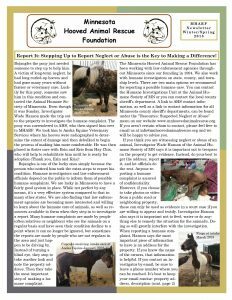 MHARF has been working with the MN Horse Welfare Coalition, the Animal Humane Society of MN, and the Fillmore County Sheriff’s Dept. 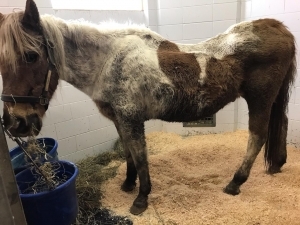 in a Fillmore County humane case involving 7 horses and a donkey (two additional horses were found dead on the property). We transported the equines to Anoka Equine Veterinary Services where they are receiving the best of care. 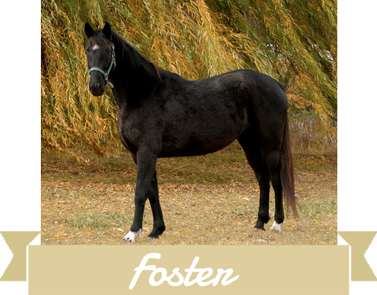 Sadly, we had to make the decision to humanely euthanize one horse (the big bay gelding). The remaining horses and donkey continue to improve. We will have more details on individual horses soon! Our popular “Geld ‘Em” bumper stickers are back! 11.5″ x 3.75″ stickers are great for cars, trucks, trailers and more. 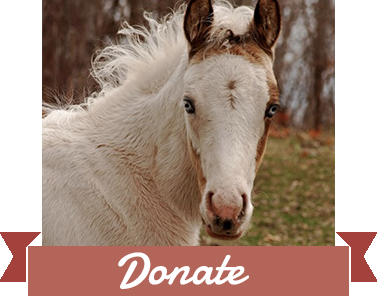 Give the Gift of Kindness with a Special Occasion MHARF Equine Sponsorship! MHARF is offering our popular “Meet, Greet, and Bring a Treat” sponsorship opportunity for any special occasion! 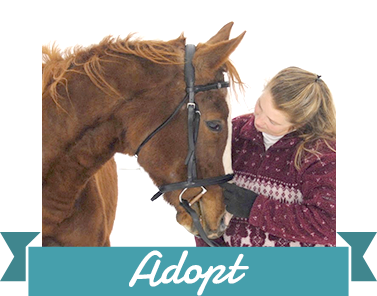 Give the gift of kindness by sponsoring a horse at MHARF! Gift sponsorships are great for Valentine’s Day, Mother’s Day, birthdays, anniversaries, weddings and any other occasion! Please Click Here for more information on sponsorships! 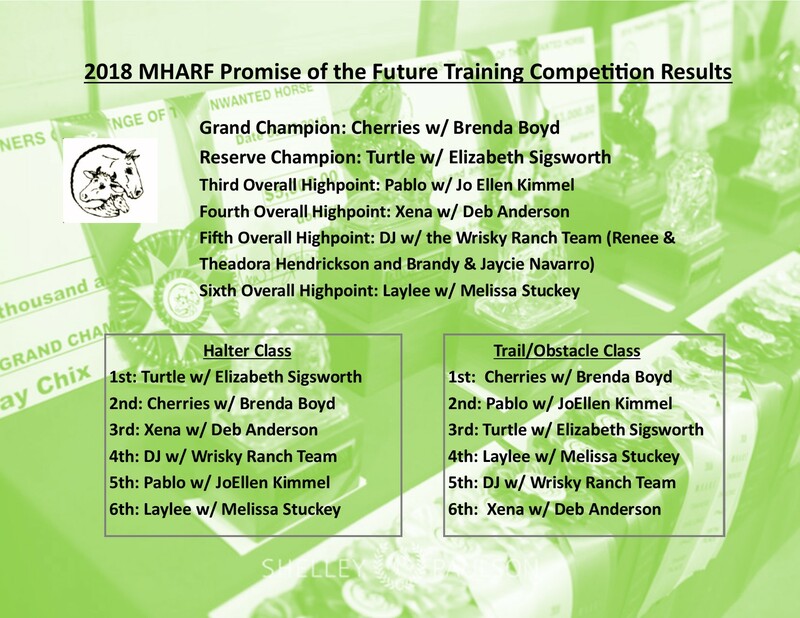 Sign up with the CHAMPION Volunteer Program through the Equus Foundation and be eligible to win Ariat gift certificates, scholarships, or even a grant for your favorite equine charity (which we hope is MHARF!) with just 24 hours of volunteer service in 2019. Click Here to view our volunteer opportunities. Partnering with Never Knock Goods! MHARF is so happy to be partnering with Never Knock Goods! 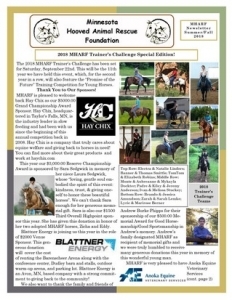 A portion of profits from merchandise sales will be donated to MHARF. Partnering with Full Stride Leadership! 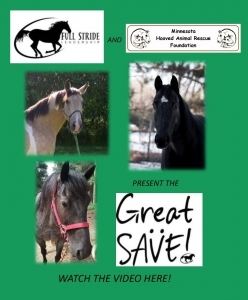 We are very happy to have been chosen as the non-profit partner for Full Stride Leadership’s GREAT SAVE program! Fifty percent of the proceeds from all Merchandise Sales will be donated to MHARF! 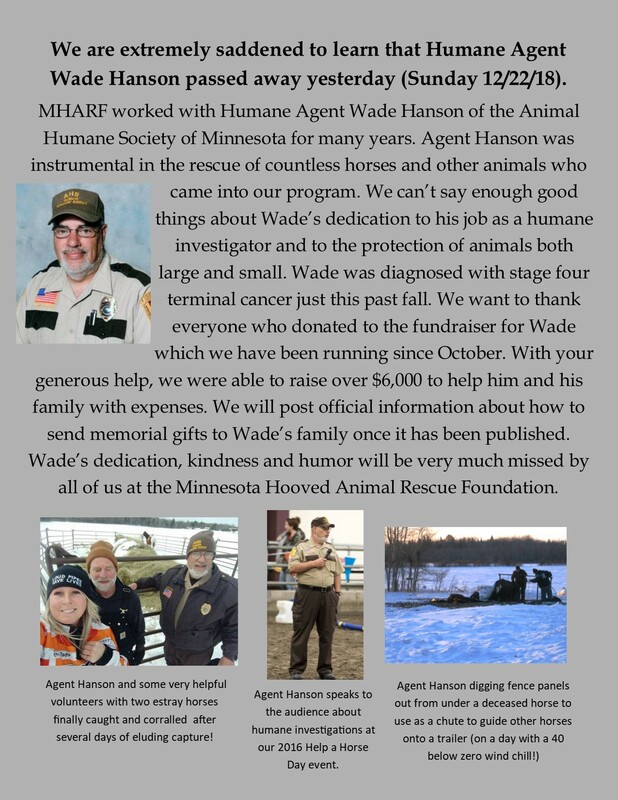 Update: We are so very saddened to say that Humane Agent Wade Hanson of the Animal Humane Society of MN passed away on 12/23/18. Our hearts go out to his family and friends. This is an enormous loss for the state of Minnesota. Wade was one of a kind: dedicated, dependable, kind, patient and professional. Wade had been diagnosed with stage 4 terminal cancer in the fall of 2018. Please Click Here to access Wade’s obituary page and find service information. 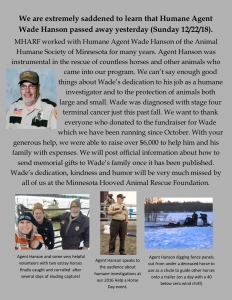 Through our Benefit Fundraiser for Humane Agent Wade Hanson we raised nearly $6,000 to help Wade and his family with expenses before he passed. You can still send a memorial gift to this online fund through the end of December. Please Click Here to read more about Agent Hanson and to make a memorial gift through our benefit page on GiveMN. 100% of memorial donations will go to Wade’s family. Memorials can also be made by check directly to the family though the bank: Wade Hanson C/O Member Cooperative Credit Union, 305 Lundorff Drive, Sandstone, MN 55070. 2019 MHARF Calendars Now Available! The 2019 MHARF Calendar is now available! Full color, 12-month, spiral bound calendar full of photos and stories of MHARF horses! Please Click Here to order! Thank you so much to everyone who donated to MHARF on Give to the Max Day in November! With your help, we were able to raise $7,965.00! Please Click Here to read about our 2018 Give to the Max Day Campaign and why we needed your support this year. You can also still donate to MHARF on GiveMN through this page at any time! Click Here to Read Our Story and to Donate Through GiveMN! 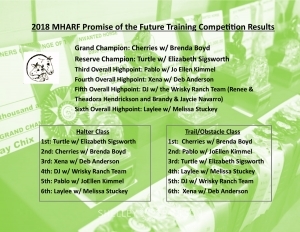 2018 Trainer’s Challenge and Promise of the Future Competition Results! 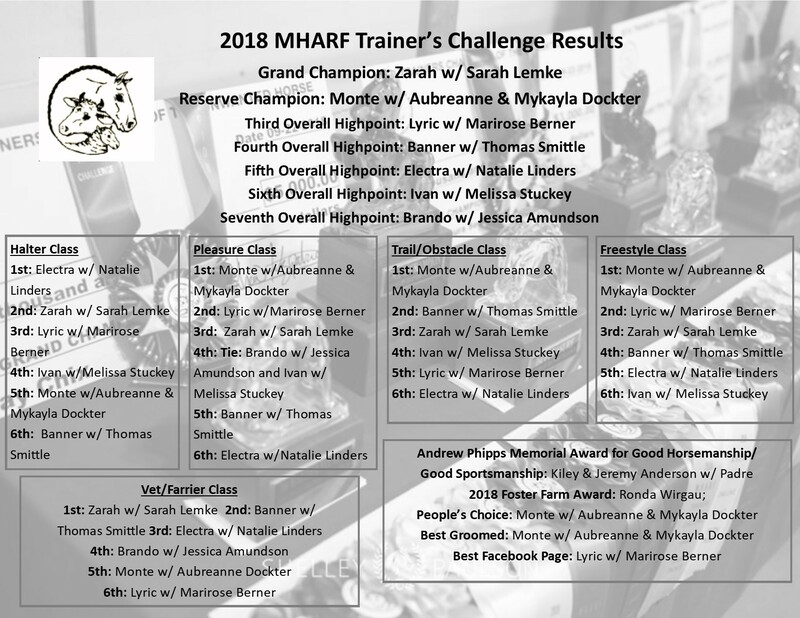 Click Here for the full gallery of 2018 Trainer’s Challenge photos! Click Here for the full gallery of 2018 Promise of the Future photos! 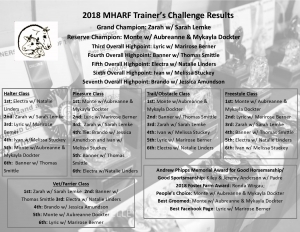 Our Summer/Fall 2018 Newsletter is out and it’s full of information about the 2018 Trainer’s Challenge and Promise of the Future competition! To view it Click Here! Everyone at MHARF wants to extend our deepest sympathy to the family of Andrew Phipps. Andrew passed away unexpectedly at age 22 on February 12, 2018. Andrew had a lifelong love of horses and worked many hours caring for them at a stable in Afton, Minnesota. 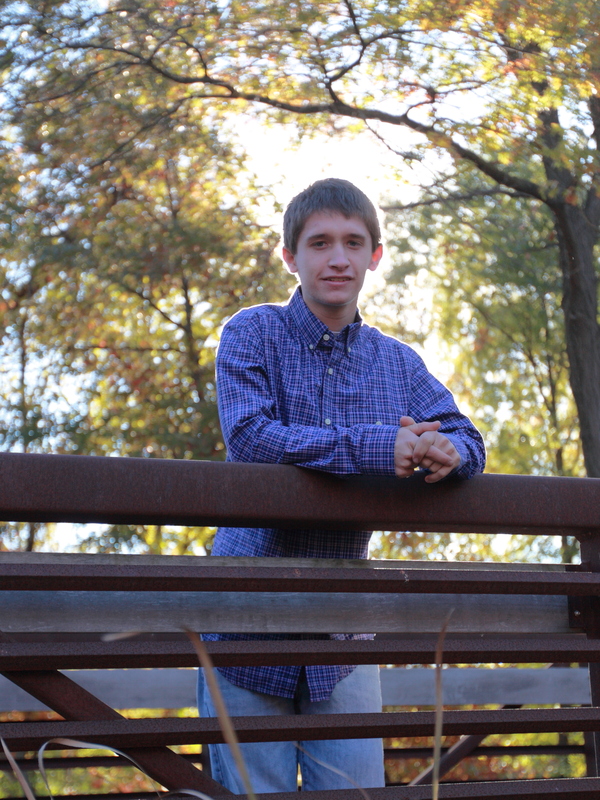 Andrew is the beloved son of Chuck and Ann Phipps and brother to Samuel and Graham. Because of Andrew’s love of animals, his family has generously designated MHARF as recipient of memorial donations. We cannot thank them enough for thinking of us at this tragic time. Our thoughts and prayers are with Andrew’s family and friends. 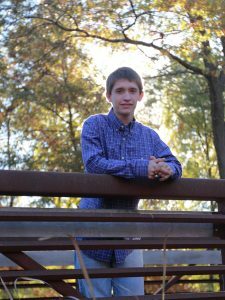 Please Click Here to read Andrew’s full obituary and learn more about this wonderful young man. For options for making a memorial donation please visit our Donation Page.